Hitting pads and drilling techniques will only get you so far. If you want to learn how to truly defend yourself, to the best of your ability, you have to integrate sparring into your training sessions. Mix Martial Arts (MMA) embraces all types of martial arts and puts them to the test in a non-restrictive fighting environment. The growth of MMA has lead to extensive creativity in the sport. Unlike its unruly beginnings, success in modern times requires individuals to be great at striking and grappling. This article provides 5 detailed tips to improve your sparring prowess and examples of how to incorporate them into your MMA sparring sessions. Footwork is essential to all martial arts. The content listed below consists of utilizing footwork to put yourself in advantageous positions. Stance - Efficient footwork and body awareness allows you to swiftly switch stances between striking and defending yourself against takedowns. Mobility - Be agile in your movements. Have the ability to suddenly stop and explode forward. This suddenness has a high chance of catching your opponent off guard. Range - Use your footwork to stay in the fighting range that benefits you and puts your opponent in a disadvantageous position. Angles and Circling - Circle out or side step at various angles to avoid blitzing and lunging attacks. Defense - Unlike boxing, you cannot simply rely on using MMA gloves to block incoming shots. You do not have the luxury of hiding behind a defensive wall formed by the large boxing gloves. Therefore, skillful head movements and footwork are necessary to minimize your chance of getting hit. Avoid Getting Pinned to the Fence - Use feints and sharp angles to dip and dart out of danger. Cage Control - Learn to pressure forward and cut off the cage properly, so that your opponent does not easily escape. One of the most common mistake occurs when a fighter moves forward in a straight line and then turns to follow, or pivots, to face their opponent that is circling away from the fence. Not only does this allow the opponent to escape, but they could now reverse the situation and back you up towards the fence. The correct movement to cut them off is to move laterally in the same direction as they are trying to escape. Additionally, you should be taking small steps forward with the leg that is cutting them off. For example, if your opponent moves to your left, then you should also move to your left and forward a bit to reduce the distance between both of you. Kicks are deadly and powerful attacks where a simple flick of the leg could send a shinbone towards your head and render you unconscious. Furthermore, low kicks punish your legs, sap its energy and wears out your mobility. Therefore, it is important to understand how to handle different kind of kicks. Active Guard and Movement Detection - It is crucial to know how to detect patterns in an opponent’s movement that hints at when they are ready to kick. This allows you to predict and get yourself ready to block or catch the kick. Avoid Putting Yourself in Bad Positions - Avoid consistently using dipping motions, which inherently lowers your head and makes it easier to be headkick, without moving out of striking range. Side-Stepping Kicks - Whether they are throwing side kicks or spinning kicks, it is important to know how to side-step and/or dart out at various angles that puts you out of immediate danger. Catching Kicks - Instead of simply blocking a kick, you could choose to catch a kick. The ability to do this requires great timing and proper techniques for it to be successful. As soon as you catch a kick, immediately lift their foot higher. This action will throw off their balance, neutralize their capacity to continue attacking and it will also make it harder for them to clear their foot from your hands and bring the foot back down. With foot in hand, promptly fire back with attacks of your own or use this opportunity to take your opponent down. Attempts to catch kicks are risky, but it has the benefits of exposing them for leg trips and takedowns. Additionally, consistency in catching kicks will cause your opponent to reconsider using it again, especially if you have shown to dominate them on the ground. Low Kicks - Kicks below the waist have to be treated differently since catching them is most likely not a viable option. Moreover, ignoring them will be detrimental to your balance, explosive movements and ability to quickly get in and out of range. Shift this leg slightly outward for outside kicks and inward for inside kicks. Use your shin to block or “check” the kick. Aim to have the higher section of your shin bone contact the lower part of the opponent’s shin. This action will make it extremely painful for them. Last resort - If you are unable to react quickly enough to check the opponent’s low kick, then simply relax the leg being kick and pick it up from the ground so that it is no longer planted. Proceed to let it follow the motion of the opponent’s kick. Doing this will reduce the damage inflicted on that leg. MMA requires their practitioners to have experience with grappling and fighting an opponent against the fence. It is an excellent skill to have when your opponent has the striking advantage and you are struggling to take them down. Dirty Boxing - Use boxing in-fighting techniques to control the opponent’s head position and throw shorts punches, such as uppercuts and hooks. Attacking from the Clinch - Muay Thai clinches and attacks are great for delivering devastating damage against an opponent with their back against the fence. Utilize the plum grip, overlapping hand grip behind the head, to control your opponent's balance and head position. Put them in vulnerable positions where you can throw elbows and knees. Pressure - To effectively punish your opponent against the fence, you must apply pressure and make them uncomfortable. Take your lead leg and place it between their legs. Drive your knee so that it makes contact with the fence. Proceed to be heavy on this leg and push the hip, on the same side of the lead leg, forward for additional pressure and to eat up space. These steps will help you pin your opponent against the fence and prevent them from escaping. Preventing Whizzers - It is important to pummel for advantageous grips, such as underhooks. However, most fighters will try to use a whizzer, overhook grip on your arm, to reverse the positions and put you against the fence. To prevent this, have your underhook arm shoot deeper so that you could grab the opponent’s trapezius on the other side of their body. Now “chicken wing” or flare up the underhook arm’s elbow. Use your non-underhook arm to grab the tricep area, just above the elbow, of your opponent same side arm. Yank and trap their forearm under your armpit. Proceed to drive your forehead under their jaw. These actions will off-balance the opponent and negate their ability to whizzer. Takedowns - The following are suggestions for takedown attempts based on your opponent’s body position and reaction. Pulling Double Leg - If they are positioned with their back leaning squarely against the fence and they have a narrow base, then this is a fantastic opportunity to simply pull their legs out from under them. A narrow base refers to their feet being positioned within their shoulder width. Dealing with Opponents Maintaining Wide Base - If they turn their body and place themselves with a wide and low stance, then you should utilize inside leg trips and outside leg wraps to take them down. After knocking your opponent to the ground or successfully tripping them, they will most likely try to retain guard and throw up-kicks as you approach. The following is a guide to minimize damage taken and safely pass the grounded opponent’s guard. As you advance forward, lean back with a straight upper body posture to prevent getting kicked in the face. Keep the lead leg bent and shift your weight to be heavy on this leg. This is a safety measure to protect your knee. If the opponent kicks at the lead leg, then this reduces the chance of it hyperextending and possibly tearing your PCL. Both of your hands should be placed by your waist and ready to catch or deflect the opponent’s feet. Deflecting Upkicks - Every time an up-kick is thrown, use the hand on the same side as the up-kick leg and push it across your body. Rotate your torso and hips to help divert the direction of this kick. Prevent Your Opponent from Creating Space. Brush their feet off your hips, so they cannot push you away to create space to get up. The motion for this is similar to the deflecting up-kick one. If their foot is already firmly placed on your hip, then the counter would be to shoot this hip forward first then follow the deflecting up-kick sequence. This action will cause their planted foot to “pop” off the hip. Leg Drag - When you are ready to pass their guard, one option is to use the leg drag. Grab the ankle or back of their heel with your same side hand. For example, your left hand should grab the opponent’s right foot. Bring this foot across your hips and use your free hand to grab the back of their knee. Take a step forward, at a 45 degrees angle, on the same side as the opponent’s leg. At the same time, pull yourself forward with the hand behind their knee. Crash your body on top of theirs and work to obtain side control. In MMA, a large assortment of grappling techniques could be used to get a takedown. The following describes how to get an opponent down by shooting for a double leg in the middle of the cage. Timing - Timing is vital to successfully securing a takedown while limiting your exposure to getting hit. Bait your opponent to come forward. Do not shoot for takedowns when they are sitting back and patiently throwing short or single punches, since they have time to recover and react against your shot. As soon as you see them committing to launching a series of punches, this is a perfect time to lower yourself and shoot for a double leg. In this scenario, they are too committed in their attacking to stop their own forward motion and recover quickly enough to impede your takedown attempt. Measuring Distance - Use jabs to measure your distance and make sure the opponent is within your shooting range. Changing Level - Before committing to your shot, you should change level. Changing your level will make it harder for your opponent to read your movement and sprawl accordingly. Launch yourself forward with your lead leg’s knee shooting towards the space on the ground between their legs. Aim your forehead at the lower portion of their sternum. Be mindful to have your forehead positioned upwards, instead of having the back of your head make contact. This prevents the jamming of your neck, which is very dangerous. Extend your arms and grip behind each knee. Forcefully pull their legs to your chest while driving your head forward. You do not necessarily have to be able to lift their legs off the ground. Your firm grip on the legs could keep them in place as your momentum drives you and your head forward to complete the takedown. As soon as both of you land on the ground, promptly move into side control. 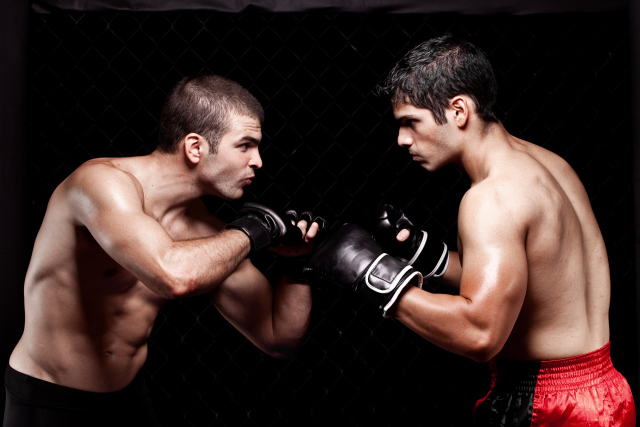 Is Muay Thai or Dutch Kickboxing Better?